Simostronomy: Carnival of Space #78 is Here! Carnival of Space #78 is Here! 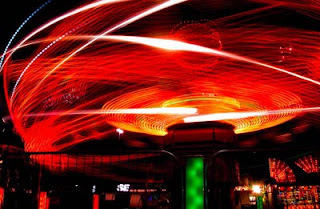 The Carnival of Space is a traveling show of astronomy bloggers that is hosted each week at one of the blog sites of the contributing authors. Coordinated by Fraser Cain of Universe Today, this week the games, rides, clowns and animals are right here at Simostronomy! Admission is free, so come on in and take a look around. 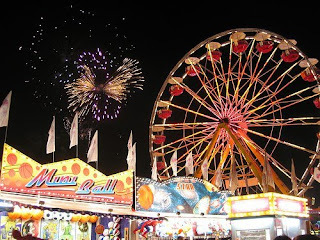 We start the Carnival off with fireworks and a bang at the Starts With A Bang blog. Ethan describes magnetic fields and the way the Sun and Earth's magnetic fields interact. Once you've got your mind around that, try this one on for size. Next Big Future describes how experiments are being conducted to create small magnetic fields with the potential to protect space travelers, much like the earth's magnetic field protects us every day from the Sun's highly charged solar wind and flares. Power to Push Away the Darkness also discusses these experiments and what seems almost like science fiction, "Raise shields!" Speaking of large magnets, AstroEngine pokes fun at Hollywood's take on the Large Hadron Collider. The comments to this post are as fun as the article! “Next on on Dawson's Creek, the teens try to understand string theory”. Kentucky Space is giving balloon rides to the edge of space! The payloads are magnetometers used to study Earth's magnetic field, cameras and other experiments, designed and built by students. The Balloon 1 Video tells the story. You better hurry up and get in line for this ride. Nancy Atkinson gives us some advice on how to prepare to make your own zero-G experience a memorable one . Commercial space flight is here! A new launch platform for commercial space exploitation is unveiled at the OrbitalHub blog. Vega is an ESA small payload rocket, capable of carrying of satellites up to 3,000 kg into orbit. When we do get to Mars look at some of the natural beauty we will find. The Martian Chronicles show us examples of modern art created by Martian dust devils. Makes me want some cotton candy. For those hoping to take a long ride, in search of habitable extra solar planets, some bad news from Centauri Dreams. 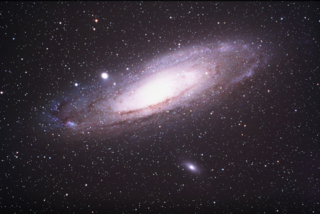 Computer simulations seem to indicate planets are unlikely to have formed in the habitable zones around the stars Centauri A and B.
Sean Welton does an excellent job of describing this months' featured constellation, Andromeda, at the Visual Astronomy blog. One of its most fascinating visual delights is the mighty spiral galaxy M31 in Andromeda. So what makes the spiral arms of a galaxy, and what are they made of? Alice takes you for a ride around the galaxy and explains why spiral arms are essentially a stellar traffic jam at Alice's Astro Info. More celestial fireworks! Invader Xan explains the chemistry and physics behind colossal supernovae explosions, and reminds us we are all Supernovae Condensate. Supernovae are super variable stars, and I am a variable star junkie. So where does the Simostronomer go to get his fix? Why the International Variable Star Index of course. The worlds newest database of variable star information. All the lights at the Carnival of Space are fully shielded, so that we don't add to astronomers' most aggravating problem- light pollution. Alan Dyer explains how this issue is now getting some serious publicity, on the cover of National Geographic no less! Three weeks sooner than expected, the Phoenix lander has gone into "Lazarus Mode". Emily Lakdawalla explains what that means to the mission and why they are so keen to get the microphone turned on before Phoenix goes quiet for good. Dave Mosher gives us the cold, hard facts about martian winter, and Phoenix' inescapable fate. Stuart Atkinson leaves us with a mix of emotions in 'Preparing to Sleep'. A farewell to the Phoenix lander, whose time is running short as the Martian nights grow long. I hope you enjoyed your visit to the Carnival of Space. My thanks to all the writers who contributed, and thank you for visiting. Come back again soon.